Dressing to highlight our most attractive features leads to feedback, both subtle and direct, from the people around us that builds confidence, self-esteem, strength and power. When we have two seconds to make a first impression, it’s important that our physical presentation – outfit, accessories, hair style – projects an image consistent with our personal brand. Why? Relationships are all about trust. If there’s a disconnect between how you “package” yourself and your professional or personal/social objectives, people meeting you will immediately question your authenticity. Linda characterizes her clients as Gold, Platinum, Copper, or Silver and sells color card fan decks that she created (great gift idea! ), personalized to each “color palette”, for only $25 – and each is sold with a lovely, protective fabric case. See photo near end of post. They’re designed to be purse or pocket-sized and easy to take along on shopping trips – so people can make a beeline for the colors that look great on them. Her clients, as you can imagine, are primarily women, but it’s just as important for a man to know how to dress to make the right impact. 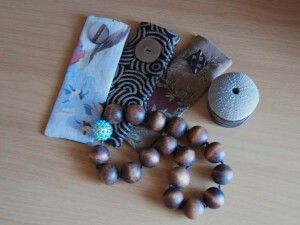 She recently spent several hours with a CEO, going through his closet and coaching him on his style and colors. The next day he hired her to deliver a full day fashion program for his 40 employees – men and women – as this year’s annual employee appreciation day event. And he’s giving each employee a True Colors by Linda “Color Fan Deck” as part of the gift. 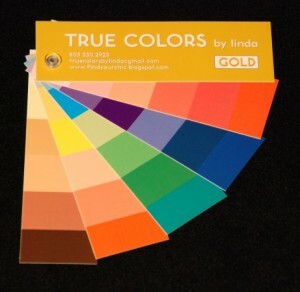 True Colors by Linda works with individual clients, and also specializes in corporate training, helping employees enhance their personal appearance and increase their self-confidence and self-esteem – two factors that contribute to improved job performance. Contact: truecolorsbylinda (at) gmail.com. 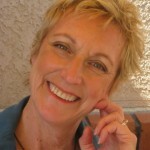 Has “Trusting Your Intuition” Helped You? How has “trusting your gut” helped you choose a new work or life direction? How did you turn off the logical voices in your head long enough to listen? Do you have a story to tell? Did your intuition help – or not? I had my colors done by Linda and now I feel like I have a whole new wardrobe. Not being a petite gal Linda’s comment about looking at yourself like a piece of art that needs to be draped really hit home for me. Linda, your story is really inspiring, and you were fortunate to have the opportunity to take time out and discover that creativity and colour inspire, and heal us from stress. Sadly many folk reach the point of burnout, or stress-related illness. In my stress management training and coaching colour and creativity are key elements in the tools and skills that people learn to combat stress and unwind. So it is great to hear about your experience and how you are helping others, and wish that I lived nearer so I could come and meet you in person. Enjoyed the info on your post. I too felt like a burnt out cog working for corporate america. I love showing people how to dislodge the source of their stress, promoting light movement and the joy of taking back their power. THanks for telling the truth about working for corporate America. Will follow your posts. Thanks Jenny! My True Colors work is now leading me in other creative directions, such as writing. What I must have done by choosing a different path is open up new channels of energy and creativity that were lying in wait. And interestingly, I am finding ways to harmoniously align my high tech experience with my creative skills, and build a new career path that is exciting and satisfying. Isn’t that what “best of both worlds” truly means?